PARIS (Reuters) - Lanvin is in talks to sell a stake to a Qatar-based investor in a deal that could value the French fashion house at around 150 million euros ($220 million), according to industry and financial sources close to the matter. The talks, subject to an exclusivity clause that runs until the end of October, come as the outlook for the luxury goods market deteriorates and credit facilities dry up, strengthening the hand of cash-rich investors. "Due diligence is ongoing. By the end of October, if the parties have not agreed on a price, Lanvin will be put back on the market," one financial source said. Lanvin moved into profit last year for the first time in decades. The talks get under way as loss-making Christian Lacroix continues to look for a buyer. Lanvin, and its smaller rival Balmain, are enjoying a revival. Analysts put Lanvin's down to fashion buyers' enthusiasm for the work of Lanvin's designer Alber Elbaz, who has infused new life into the brand in recent years. According to the financial source, Elbaz holds more than 10 percent of the company's equity. Lanvin's controlling shareholder is Taiwanese media magnate Shaw-Lan Wang, a francophile, who is looking to sell a stake of between 35 and 40 percent, industry and financial sources said. "Ms Wang wants to sell but she also wants to keep control," said one industry source who is close to Elbaz. "That is why a deal is far from being reached." Wang acquired a holding from L'Oreal in 2001 and bought out other investors in 2003. Last year, she sold Lanvin's perfumes unit to France's Inter Parfums for 22 million euros, leaving the group without one of the traditional industry vehicles for brand development. Lanvin's lack of full control over trading in Japan is a further complication. The country remains the world's second largest luxury goods market, according to consultants Bain & Company, even though it has been shrinking in the past three years. In Japan, Lanvin clothes are sold under a license owned by conglomerate Itochu, which holds 5 percent in the company and in 2007 made an estimated $280 million in sales from Lanvin-branded clothes, more than the couture house made itself. "No-one at Lanvin likes to talk about these negotiations but they know they are taking place," a second industry source said. Lanvin declined to comment or respond to questions. Founded by Jeanne Lanvin in 1889, Lanvin is the oldest French couture house and made revenue last year of between 100 and 110 million euros. The financial source said the business could be valued at between 1 and 1.5 times (annual) sales. At the beginning of this year, Lanvin Chief Executive Paul Deneve told Women's Wear Daily the company was expecting revenue growth of 40 percent in 2008. But the fourth quarter could prove more difficult than forecast as well-heeled customers start to tighten their purse strings, luxury goods analysts say. At Lanvin's Faubourg Saint-Honore flagship shop in Paris last week, customers waiting at the cashiers were mostly from Russia and the Middle East. 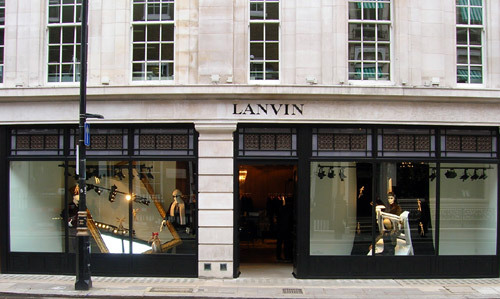 Lanvin also has branches in London, Moscow, Monaco and Geneva, and hopes to gain a strong presence in the United States and the Middle East. Its popular flat ballerina shoes, black or gray ribbon-themed outfits and accessories feature prominently in trend-spotting shops in Paris such as Colette and Montaigne Market, alongside 1980s-inspired collection from smaller house Balmain. Balmain, which was founded in 1945 by Pierre Balmain, is also renewing ties with fashion devotees under the creative stewardship of Christophe Decarnin, formerly of Paco Rabanne, who produced his first show for the brand in early 2006. Balmain, which generated sales of 7 million euros in 2007 and is majority-owned by businessman Alain Hivelin, could also attract new investors, industry sources said. A source close to Balmain said the designer's sales were nearly doubling every season. "I would not be surprised if investors were circling around the brand," the source added. A Balmain spokesman said the business was not for sale. The famous London department store Selfridges said its supplies of Balmain's mirrored tunics, retailing at 1,465 pounds ($2,641) each, sold out in one day this season, while its ruffle lace embellished waist mini-skirt at 2,695 pounds had a waiting list and "did not reach the sales floor." Unlike Lanvin and Balmain, Christian Lacroix is not enjoying much sales momentum, but it, too, is looking for fresh capital. Lacroix, the couturier known for its flamboyant colors and baroque style, was sold by French luxury group LVMH in 2005 to the Falic family, the force behind Duty Free Americas. Last year, it made losses of 5-10 million euros on sales of about 35 million euros, a source close to the company said. Falic has been in talks with potential investors for many months. Contacted by Reuters, Lacroix would only say: "Discussions are continuing." It declined to give any details.